Little did I know how much a little BBQ sauce can change things. This recipe was the best one! If you’re on the ball, this is a recipe that takes only a few minutes to prep. Start by preheating your oven to 375 degrees. Next, grate 1 carrot and 1 small yellow onion. Then drop the small chop on 1 stalk of celery. Combine with 1 1/4 lb. ground turkey, 1 egg, 1/2 c of BBQ sauce, 1/2 c of panko bread crumbs, 1 t of salt and 1/2 t of black pepper. Make sure everything is incorporated well. Put all the ingredients in a loaf pan, or form into a loaf and put into a baking dish. Bake about 45 minutes or longer depending on the size of the loaf. 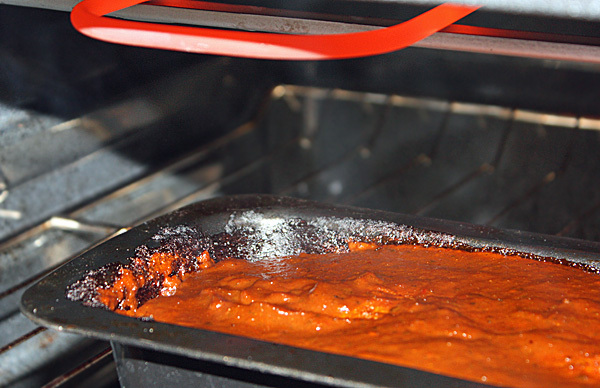 When the meatloaf is cooked through, use the remaining 1/2 cup of BBQ sauce to cover the top. Use the broiler in your oven for 1-2 minutes just to get a little caramelization on top. When you’re ready to serve, slice into four pieces. While the meatloaf is cooking, prepare the potatoes and green beans (time it correctly so you have fresh spuds close to when the meatloaf is ready). 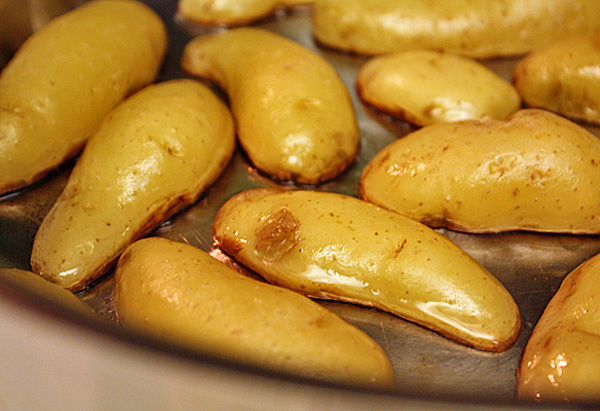 To start, slice 16 fingerling potatoes lengthwise. Take 3/4 lb. of green beans, remove the stems and cut into two-inch pieces. In a large saute pan, heat 2 t of oil over medium-high heat. 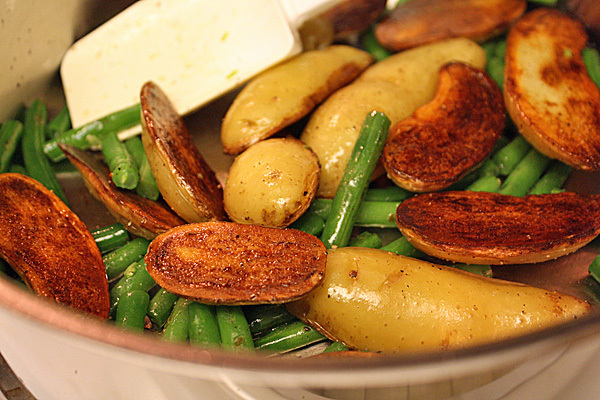 Add fingerling potatoes cut side down and reduce the heat to medium-low. Keep the potatoes cut side down and cooking until almost cooked all the way through, about 20 minutes. The low heat won’t burn them, but will make the cut side super crispy. While the potatoes are pan roasting, bring a pot of salted water to a boil. Add the green beans and cook for 2 minutes. Strain and leave out to cool. When the potatoes are tender, turn up the heat to high. Add the green beans and saute for 1-2 minutes. Season with salt and pepper. I left my potatoes down a little too long, making them a little darker than golden brown, but they were fantastic regardless. This is a potato side dish I’ll be going back to many times over. 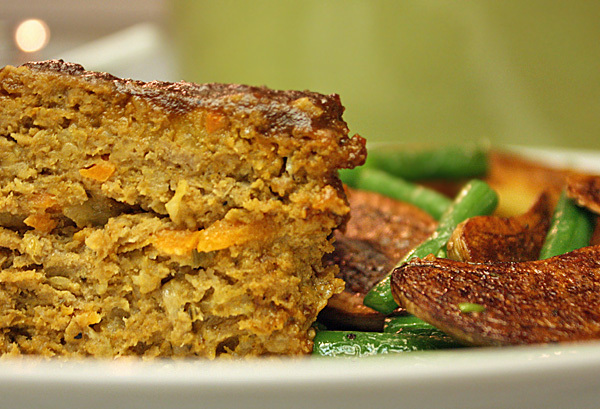 To plate: Grab a slice of meatloaf and a share of the potatoes and green beans and dig in! Much of the reason I have never liked meatloaf before is because of the tomato sauce (just ketchup even at some places!). I thought Chef Brian’s use of BBQ sauce instead of ketchup was a much better way to flavor the turkey with punch and spice. 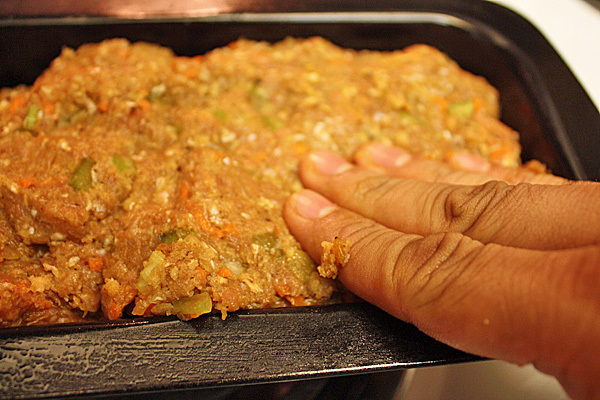 The loaf was juicy and the grated vegetables added taste without compromising texture. Quick and easy, super tasty — this is one meatloaf I’d be down for any night of the week. 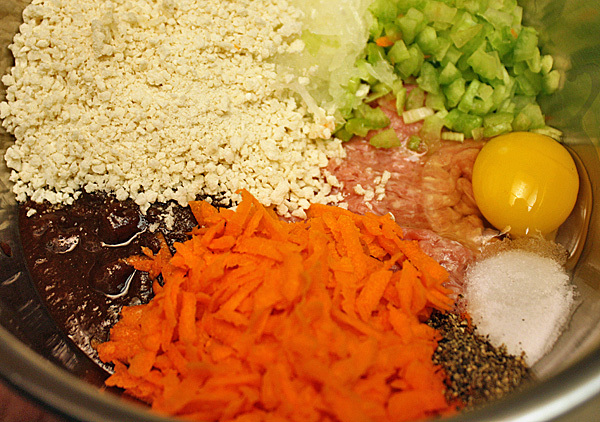 Grating carrots and adding them to meatloaf is a great way to add some veggies to a meal. I love the extra carrots and the texture they add.